Hello friends! I am really excited to start the week off with this post. 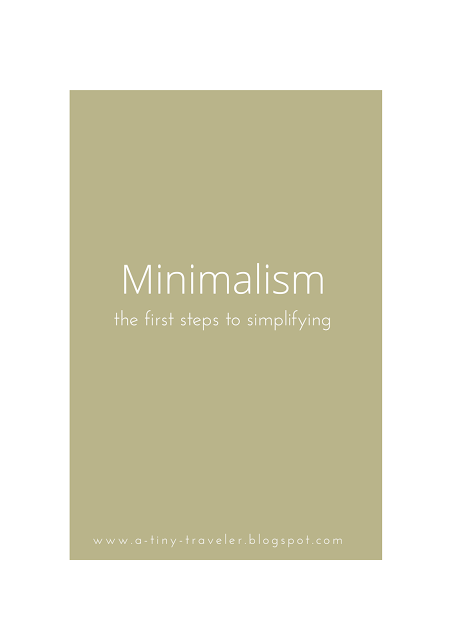 Lately, I've been reading a lot of different how-to posts and opinion pieces on the concept of living minimally. I know people that are true minimalists and do it so well, like my friends Brandon and Britney who live in a Tiny House. Then there are other friends that have recently started their journey towards simple living like Katherine. 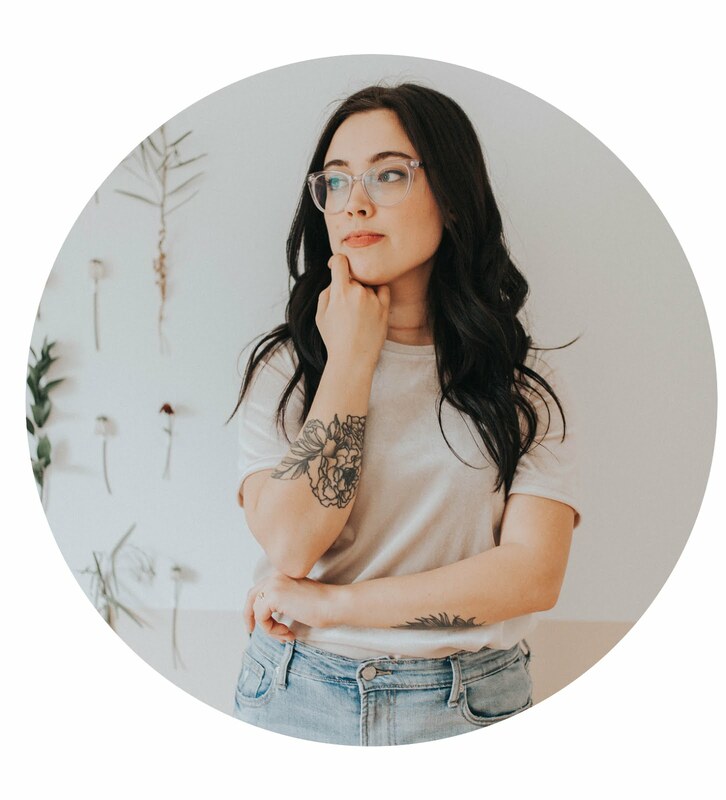 She just posted a great collection of resources for those of us that want to scale down and live simply but don't know where to start. She also introduced me to the 30-day Minimalism Challenge that starts August 1st. I can't wait to take that challenge on! 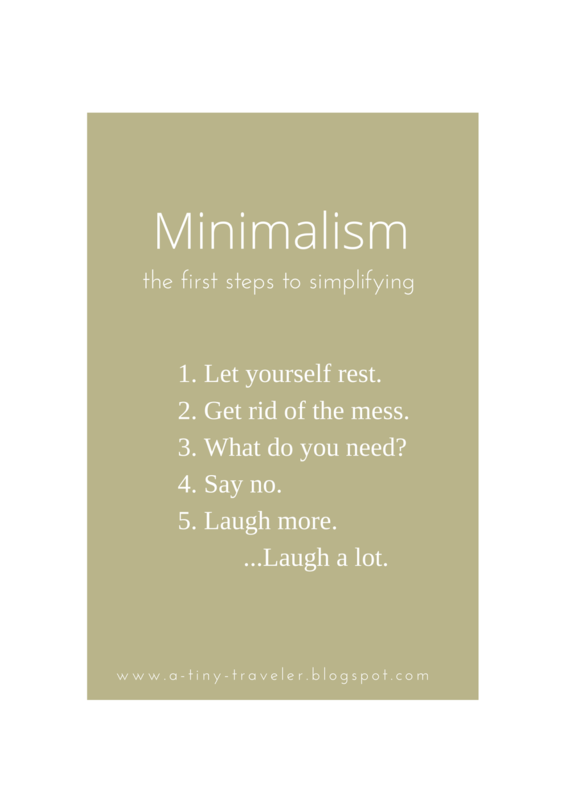 Over the last few months I have been taking small steps towards simple living. I've been getting rid of old clothes, saying no to super late nights, and giving some more time to the things I love. (These aren't necessarily the only ways to simplify, but they're ways that are really helping me out so far). Today I wanted to share a few tips on how to decrease the clutter and the overload in our lives and start the journey towards living simply. One of Oakmoss Collective's main goals is to live simply and enjoy the pace of nature and the beauty of life. That's a little hard to do when we're on overdrive and always getting, getting, getting. So to kick off what I hope becomes a little series of posts that are published here and at Oakmoss, let me give you my 5 tips for walking towards a simpler, less cluttered life. Step 1: Let Yourself Rest. I cannot stress this enough. Being busy and tired is the worst. We all have families, personal things going on, school, or work and life gets busy. That's just the pace to expect in today's society; fast paced and always trying to advance. When we get caught up in this, we miss the little things. We switch from enjoying watching the cream swirl into a cup of coffee to grabbing that to-go cup and rushing out the door. We don't stop to say hello to anyone, we just get to where we need to go with our faces glued to our phones that whole time. We need to allow ourselves to slow down a little. When you have some down time, don't feel bad for resting. Don't make yourself so busy that you forget what naps are! 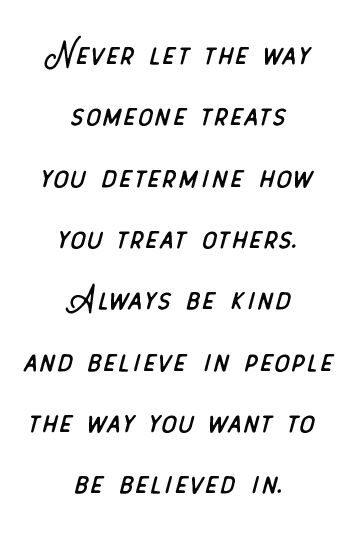 This is something that I am re-learning. When I have some free time I often try to fill it with technology or hobbies, yawning all the way through. It's okay to take a nap and rejuvenate. Step 2: Get rid of the mess. This is something that I was brought up on. If there's a mess in the house, something must be horribly wrong. That idea became a little looser when my little sister and brother were born because keeping a clean house with 2 little kids is a bit difficult. I understand that. But if you often make the floor your hamper or let the dishes pile up, it's time to make a change. Keeping things clean and tidy really helps bring positivity into your home and into your life. PLUS it starts a really great habit of being organized and tidy! You should ask yourself this question at least once every day. When you're shopping online or in a store. Do I need this? When you're cleaning your house and find something that has been missing for a few months. Do I need this? When you're going through your closet and have a pile of shirts from 2002 that you swore you'd be able to fit into again. Do I need this?? Whatever you realize you don't need, make a pile of and donate it to thrift shops or Goodwill. There are also plenty of websites and stores that will buy back your items that are in good condition. Getting rid of clutter and old stuff takes such a weight off your shoulders. I recently went through my closet and got rid of so much and it felt great! Also, bloggers... this one is for you. When you do product reviews or when a company sends you something to test out that you know you don't need or when you've written your 10th book review and the stack of unwanted books is piling up, it's time to give them away. That's great that it was free! But do you still need it? When you're at the mall. When you've overcommitted in your schedule. When you're asked to do just one more thing. It's okay to say no! If you don't have the space, the need, or the time you're allowed to decline. Even if it's something positive. If you volunteer at church or at the library or a homeless shelter and you have one day off, it's okay to say no and enjoy that day for yourself. If you're shopping with friends and they all try to convince you that you need another black v-neck, you can say no. Having 5 of the same shirt is probably enough, if not too much. Don't feel guilty for saying no and (this brings us back to step 1) letting yourself rest and have a little me-time. Step 5: Laugh more. A lot more. I have read countless studies that happy people are healthier people. Laughing is so good for you! Let yourself enjoy time with family and friends. Watch a comedy. Do what you love. Let yourself be silly! If you aren't enjoying the little things in life, what are you enjoying? These are just a few tips that I've found to be really helpful on my journey to simpler living. I've got a whole ton of posts cued up for different areas in which we can all simplify and can't wait to get this series started! Be sure to stop back and read more every week. Natalie I love this post! I have also started the process towards a more simple life by cleaning out my closet last week and getting rid of about half my clothes! I'm going to take a look at that 30 Day Minimalism Challenge too! thanks for sharing! I loved your tips! My dad and I have been after a minimalist lifestyle for the last two years. As artists, we've discovered it's easier to do with things like clothing and household appliances, but it's harder with art supplies, especially since we both dabble in just about every medium. It's a difficult process, but we're learning to tell the difference between things we'll actually use and things that are just clutter. I plan to join in on the 30 day minimalism challenge, but I'll probably start after family vacation, since it will be a little easier when I'm not living a differently life-style five states away from home. I loved hearing your thoughts and can't wait to read more! Amen, girl! You know I love this :) I'm so glad that you're thinking about living simply and what that means for you! Thank you! It's a collection of different things I've read online and actually tried out and they seriously help a lot! I hope you continue to find ways to live minimally! So many good tips. My husband and I try hard to make rest and slowness priorities in our marriage and our home. I love how when we leave time open our days get filled with people and relationships rather than craziness and commitments! Thanks for sharing! These are so important! It's amazing how just being intentional about living simply and with less can make such a difference. The focus of my blog is simple living in every aspect of life- so I LOVE seeing other posts like this. That is so true! I love when our days get filled with "business" from the good things, rather than self-made business. Thank you for reading, Lauren! This is really so great. I didn't even know I wanted to be a minimalist until I read this post. Thanks Nat. Challenge accepted. Yay! Good luck and have fun :) After you get started, it feels so refreshing and like you're losing so much unnecessary weight on your shoulders from stress and clutter, etc. I've got a lot more posts lined up about aesthetic, activities + DIYs, and minimalistic inspiration too! I'm such a messy, night-owl, hoarder type and I REALLY want to change. Perhaps I can take a few of these steps and start in the right direction? Thank you for the nudge! I need to get on this 30-day minimalism challenge :) This was a great read and great reminder to step back and really think about the decisions I make daily with regards to time and money. My husband and I have been looking around at houses and although there's a large part of me that wants bigger and better, I've been convicted lately to keep things simple + minimize! what a huge change. Super exciting! This has been on my mind a lot! This summer I lived for a month and a half out of a suitcase & a backpack, and I didn't wear all the clothes or use any of the junk I packed. Plus I have so much in storage in my hometown. I really need to simplify!